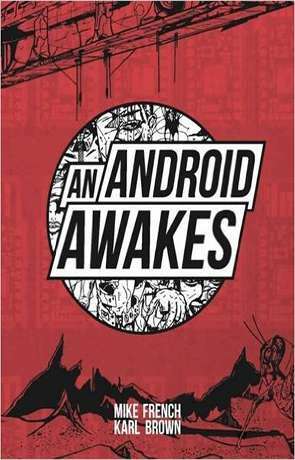 Billed as a ‘graphic novel, novel’ An Android Awakes tells the story, through pictures and words, of Android Writer PD121928 as it tries to produce stories that a publisher will accept before the submission limit on its programming runs out. What we have here is an innovative throwback; something that returns us to the picture story premise of old annuals and paperbacks, but presents itself to a graphic novel audience. The balance of narrative is weighed towards the writing, with the drawings more of an illustration of scenes and in this, there is something a little disappointing, as the book has moved away from the stronger tradition of visual storytelling a graphic novel or comic book would afford. The pictures do not have essential narrative content, where they might in these mediums. However, the stream of consciousness premise of the text is fascinating as PD121928’s draft submissions bleed into one another with throw away references, remembrances and retellings that turn a collection of discreet narratives into parts of the struggling writer’s experience. We have a linked world through referentiality, but this world operates in two spaces; the one developed in our minds and the one developed in the mind of the Android. This world is intentionally flawed as ideas are re-shaped and re-used in different submissions, but the reader finds themselves imagining a world where all the tales fit together consistently as this is the way in which we would read other texts that interconnect in the same way. This tells us something about ourselves as readers and the instinctive habits our consummation of stories can create. The illustrations have a crisp and busy quality to them, providing images and faces to the scenes described. Both writing and drawing clearly signal this as an adult collection, although not in a way that promotes excess. Eventually the narrative moves to its social comment punchline. PD121928 does get a story accepted, but achievement is not quite all it could have been and we are left to judge the idiosyncrasies of publishers in this strange future, not unlike the way in which we might smile at their choices today. An Android Awakens is a thoughtful creation which will inspire thought in its readership. In time perhaps we’ll see a return to storytelling in this medium and a greater level of experimentation with narrative delivery with words and pictures. Written on 18th November 2015 by Allen Stroud.